What comes to mind when you hear the name of this evangelistic legend? For me, it’s the memory of attending a Billy Graham Crusade held in a massive stadium filled with people. Years later in San Antonio, Texas, my husband and I took our youth group to hear Billy Graham during one of his final Crusades. I was in awe as Graham shared simply and clearly the call to repentance and surrender to Christ. I thought, who is this man who speaks with such authority? How did God bring him to this place? 10 Things You Didn’t Know about Billy Graham. Billy Frank (his name as a boy) was raised on a dairy farm near Charlotte, North Carolina. He was the oldest of three children, so many of the farming chores landed on his shoulders. Seven days a week, morning and evening, it was Billy’s job to milk the cows, which meant waking at 2:30 each morning. For two hours, Billy would milk twenty cows, and then shovel away the manure. Once he completed those tasks and fed the cows fresh hay, it was time for Billy Frank to head back to the house for his own breakfast. Can you imagine how tired this young boy must have been? There were times he could barely keep his eyes open at school, but a good game of baseball on his lunch break always revived Billy for the rest of the afternoon’s classes. Billy Graham’s mother was a devout Christian. For the early part of his upbringing it was apparent to Billy that his mother, not his father, was the one most concerned with training the children in religious matters. For example, his mom was the one who insisted the family regularly attend church each Sunday. And if for some reason they could not attend, she would gather all three of her children around after dinner to read them a Bible story. When Billy was only 13 years old, his father’s ranch hand came in the middle of the day to pick he and his sister up from school. Since this never happened, Billy knew something was terribly wrong at home. Billy was sad to learn his grandmother was ill to the point of death. Billy liked Grandma Coffee and enjoyed when she would tell him stories about the American Civil War. Her husband, Billy’s grandfather who died before he was born, had fought in that war, losing both a leg and an eye in battle. His little sister, Catherine, reminded Billy that their grandmother would soon be going to heaven to be with Jesus. As the family sat around Grandma’s bedside, she bolted up in her bed declaring that she could see Jesus with his arms outstretched toward her. And with Him was her husband––completely whole with both eyes and legs! With that final declaration, Grandma Coffee breathed her last breath. Witnessing the transformation in his father after a near death experience was a pivotal point in Billy’s own pursuit of spiritual matters. Soon after his grandmother died, Billy’s father’s face and jaw were crushed and disfigured from an accident on the farm. The family did not expect him to live. As time went on and his father’s health did not improve, Billy worried he would have to quit school to help take care of the family farm; however, Billy’s dad did recover. His face would forever be deformed by the accident, but Billy couldn’t help but notice that his dad’s spiritual condition was transformed as well. Soon, Billy’s parents were holding prayer rallies at their farm. Billy was always quick to find an excuse not to attend the meeting. One night, he overheard his dad telling his mother how a man named Vernon Patterson had prayed for God to raise someone of Charlotte, North Carolina who would preach the gospel to the ends of the earth. Billy was skeptical that God could answer such a request. Billy thought he had heard it all before regarding spiritual matters, as he’d grown up going to church. By age 10, his mother made him learn the Westminster Catechism––which consisted of 107 questions and answers regarding foundations of faith. To this point, attending church was more of a drudgery to Billy. He felt the pastor spoke in a monotone, uninteresting manner, and the songs were more like dirges. He often pondered ways they might make church more interesting. When Billy would lay in bed at night, he couldn’t shake the image of his grandmother seeing both Jesus and his grandfather. His grandmother’s comments on her death bed made Billy really believe that there was a heaven, which he'd been unsure about up to that point. When Billy’s parents invited him to attend a revival meeting, he agreed to go because he had heard there would be a clash between protesters and the evangelist. At the revival there were no protestors, only thousands of people streaming into the tabernacle to hear the evangelist’s message. Night after night, Billy snuck into the back of the tent to listen to the powerful and convicting sermons––something stirred in him that made him sorry for his sin. After many nights of meetings, Billy finally walked forward to turn from his sin to follow Jesus as his Lord and Savior. As he walked forward he wondered, Do I really want to hand over my dreams and my future to God? But the gospel was irresistible and Billy repented of his sins and surrendered to Christ. He could never have known what amazing plans God had for his future! Of course, Billy’s school friends teased him about his newfound faith and name change. Soon, they began calling him “Preacher boy.” Billy didn’t care. And he was delighted when two other friends who had also accepted Christ at the reveal meetings became his close friends, and they all helped each other to grow their faith in Christ. In his lifetime, he has led countless people to Christ. When he was 30 years old, a group called ‘Christ for Greater Los Angeles’ invited him to preach at their revival where thousands of people would attend the five-week long revival. With heavy news coverage, Billy Graham instantly became a national figure. Reverend Graham has also served as advisor to many presidents. In 1983, he was awarded the Presidents Medal of Freedom––the nation’s highest civilian award. He has appeared 57 times on the Gallup organization’s list of the most admired men and women. Graham was named an Honorary Knight Commander of the order of the British Empire for his 60 years of international contribution to civic and religious life. He is regarded by those who know him as witty, non-judgmental, genuine, innocent and patient. But Billy Graham’s greatest accomplishment will be revealed one day in eternity when The Lord shows him the harvest of souls from his ministry on earth. Talk about a life well lived! Think about it: the people in Billy’s small farming community came together to regularly ask God to raise someone up out of their midst who would preach the gospel to the whole world. Billy had no idea he would be that man. He was just a normal boy who loved baseball, dressing well, and many of the other things any young man his age would have enjoyed. But when God got a hold of Billy’s heart, there was no stopping this man’s zeal for proclaiming the gospel! If God uses ordinary men to do extraordinary things––can you believe He will accomplish His plan and purposes through your life, too? What might God do through your children if you commit to pray and guide them like Billy’s parents did? When Billy went forward at revival to surrender to Christ, he was nervous about what wholehearted devotion would mean for his future. In the same way, only God knows what He has planned to do through your life before the foundations of this world (see Ephesians 2:8-10). Will you surrender? I am confident that if you do, you will one day look back at a life well lived––and you will have no regrets. 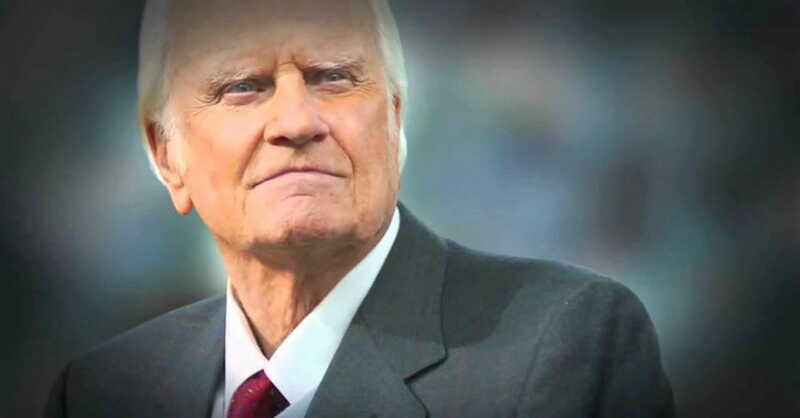 Watch a Live Stream of Billy Graham's preaching from the Billy Graham Evangelical Association. Visit the BGEA's memorial page for Billy Graham to leave a condolence message. Listen to Rhonda Stoppe discuss the life and legacy of Billy Graham on The No Regrets Hour. Rhonda Stoppe is the NO REGRETS WOMAN. With more than 20 years experience of helping women break free from regrets that hold them back. I could have listened to Rhonda talk all night, is what women say about Rhonda’s enthusiastic, humorous, transparent teaching, and zeal as an evangelist to women. She’s committed to fulfill the Titus 2:4 commission by mentoring, teaching and writing books that are inspiring, grounded in Scripture and easy to read––like you're visiting with a friend over coffee. Rhonda appears on radio programs, speaks at women’s events, Pastor’s Wives Conferences, MOPs and homeschool conventions. God is using her evangelism conferences to bring women to Christ. Rhonda ministers along side Steve, her pastor-husband, at First Baptist Church of Patterson, California. Together they write books and speak at their No Regrets Marriage Conferences, but their favorite ministry is their family. They have four grown children and eight grandchildren.